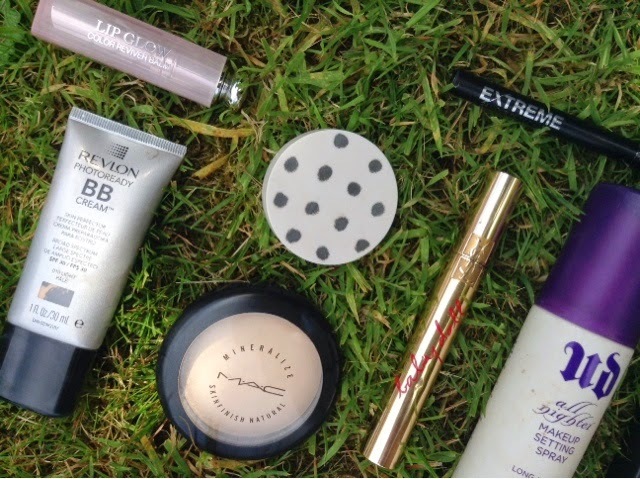 So as the weather gets hotter and air gets more humid, I don't know about you but makeup just seems to be sliding off my face almost straight away, and when it's warmer, it doesn't feel right putting on the whole heavy duty foundation routine. 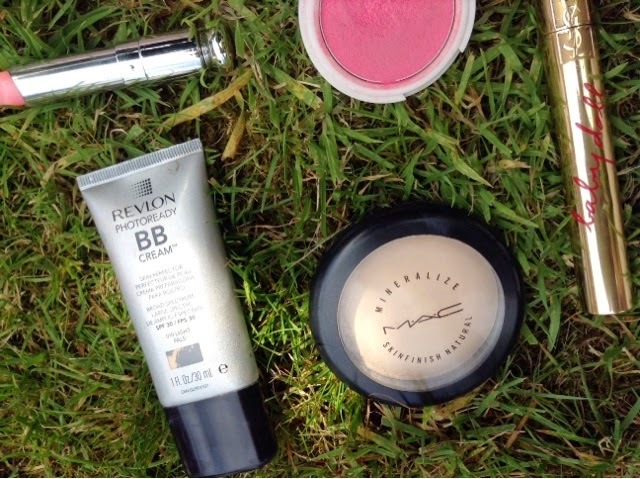 As the summer holidays have gone on, I've started using less and less products on my face and found ones that look just as good as a full face of makeup, but just feel a little lighter and don't take as much effort, because who wants to be wasting their precious summer time blending their eyeshadow when there is sunshine out there to be enjoyed! For base, I simply use my holy grail light coverage product, which is the Revlon Photoready BB Cream, as it looks fresh and dewy with a light coverage and doesn't slide straight off my face, plus it has an SPF of 30, perfect for this summer heat. As the BB cream has a lovely dewy finish and I don't want to ruin that, I use a light dusting of the MAC Mineralize Skinfinish Natural, which gets rid of any shine and sets the makeup, but doesn't make my skin look overly matte. On my cheeks for a pretty flush, I use my Topshop Cream Blush in the shade 'Prime Time', to go with the dewy, fresh look, using my Real Techniques Contour Brush. As for eyes, although I do love my trusty Naked 3 palette for spring and summer time, sometimes it's just as pretty to go with a classic flick of black liquid liner, so for that I use my Collection Extreme 24 hour Felt Tip Liner to draw a thin line just above my upper lash line. For seperated, fluttery lashes in seconds, I can always depend on my trusty YSL Babydoll mascara, on my bottom and top lashes. As I'm a fair haired girl with rather fair coloured brows, I don't do much to them anyways, so a simple yet great way to fill in and set your brows in a flash is using a brow mascara, like the Maybelline Brow Drama. A quick brush through my brows and I'm good to go! To finish off the makeup, I apply my favourite new addition to my lipstick creation, going by the name Dior Lip Glow Colour Reviving Balm, as although I'm a fan of bright pinks and corals for the summer, a wash of colour like this is easier to maintain throughout the day without worrying about smudging or getting that awkward 90's style lip liner look. Something that I've found really helps my makeup last and stay looking cute throughout the day is my Urban Decay All Nighter Setting Spray - a few spritzes over my face to seal the deal and it won't budge! 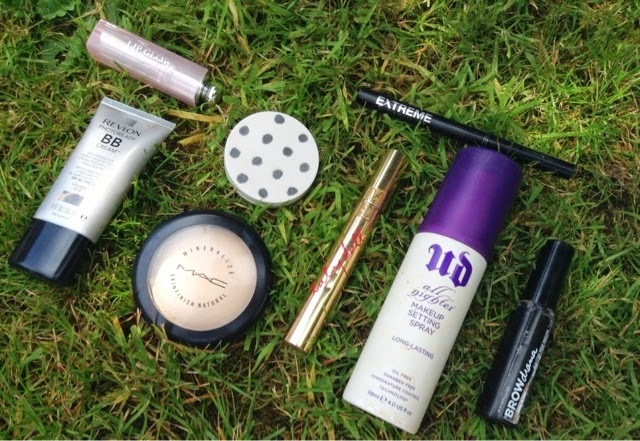 It's fair enough that some people may say that even this amount of makeup isn't nessessary for the summer months and it's good to let your skin breathe, but if like me, you still want to make a bit of effort - this is certainly the way to go!